A new route is always exciting, to some degree. The trip may start out a little hairy, perhaps, on the first run before you’ve mentally logged the whereabouts of each pothole and suddenly-vanishing bike lane, but change is always refreshing to a certain extent. My new route involves the Oval and subsequent approach to Vauxhall Bridge. Now, the Oval actually isn’t half as bad as it seems – the bike/bus lane combination is fairly smooth and the single lane of traffic makes it much quieter. The approach to the Vauxhall Bridge, on the other hand, is a road-planning disaster. 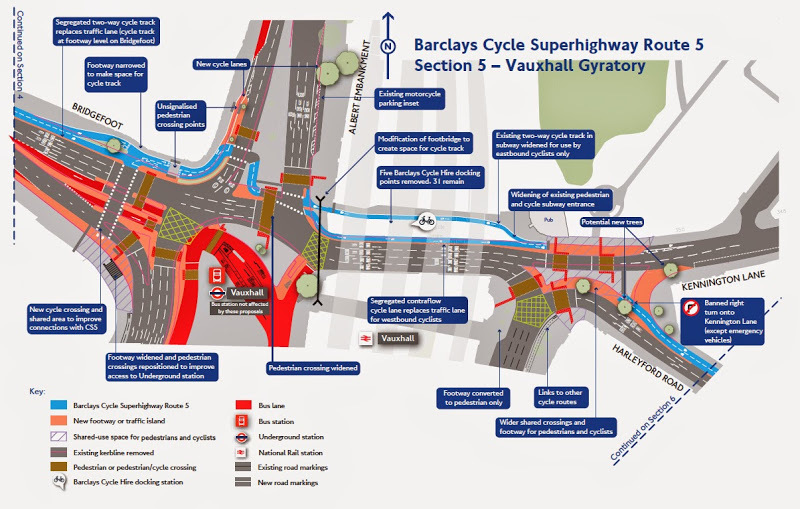 At its widest there are 6 lanes of traffic that any cyclist taking the Vauxhall Bridge or turning right will be obliged to take. To the novice, there is also an unexpected bus depot lane that suddenly appears, feeding an extra level of traffic into your path. My advice: follow any one of the erratically-placed and completely illogically-routed bike lanes around the outside of the roundabout/concrete spaghetti-track. It’ll take a few attempts and definitely a few bemused and/or angry pedestrians to figure out the best way but all crossings are shared-use and there are hints of and actual, solid, newly-painted bike lines at every corner so try and stick to them, making your way in ebbs and flows but with both legs remaining in tact.